The shark inhabits the depths of the Pacific and sports an exceptionally large nose. Etmopterus lailae is a member of the Lanternshark family, living more than 300 meters (1000 feet beneath the surface). Image credits: Stephen Kajiura, Florida Atlantic University. If you go deep enough, underwater life starts to become really bizarre. Where light just barely goes through (or doesn’t at all), pressure starts to mount up, and temperatures drop significantly, creatures have adapted in complex and often strange ways. Eyes can grow very large to capture what little light comes through, or decay completely and abandon any hope of visibility. Membranes and proteins start to develop specific structures to cope with the pressure, and because food is so scarce in the absence of all photosynthesis, fascinating feeding mechanisms have emerged. Among these adaptations, bioluminescence plays a special role. Bioluminescence is any production and emission of light by a living organism. In the deep oceans, every bit of light can make a difference, and bioluminescence can help in a number of ways. It can serve as a headlight (the so-called photophores of lantern fish), to lure unsuspecting prey (for the anglerfish), or even to attract sexual partners. The oceans are vast and very dark, so that can be a daunting task. Some creatures such as sea cucumbers even use bioluminescence as a “burglar alarm” — whenever they’re attacked by a predator, they light up to attract an even bigger predator to take care of the threat.They can even spray glow-in-the-dark mucus on the predator so that the “police” can find it later. This newly discovered shark, Etmopterus lailae, is also bioluminescent, but that’s hardly the most remarkable thing about it. Image credits: Stephen M. Kajiura, Florida Atlantic University. Weighing less than 1 kg (two pounds) and measuring less than 30 centimeters (1 foot), the shark is still a sight to behold. 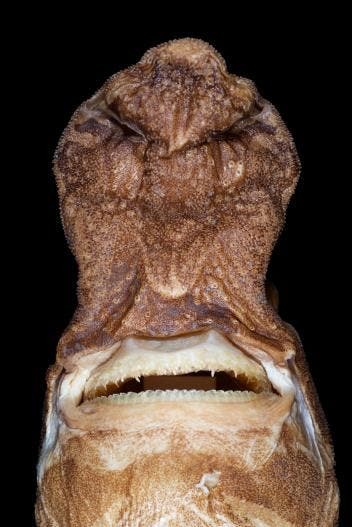 Found in the Pacific Ocean off the coast of Hawaii’s northwestern islands, it looks more like a fairy tale monster than a shark, but that’s to be expected for such a deep dwelling predator. The shark was discovered 17 years ago, but it took a really long time to properly identify it. At first, Stephen M. Kajiura, the study author thought it wasn’t a new species. When he submitted the findings to a journal, a reviewer told them the shark is not what they think it is. This came as quite a shock — a thrilling one, as Kajiura himself notes. “There are only about 450 known species of sharks worldwide and you don’t come across a new species all that often. 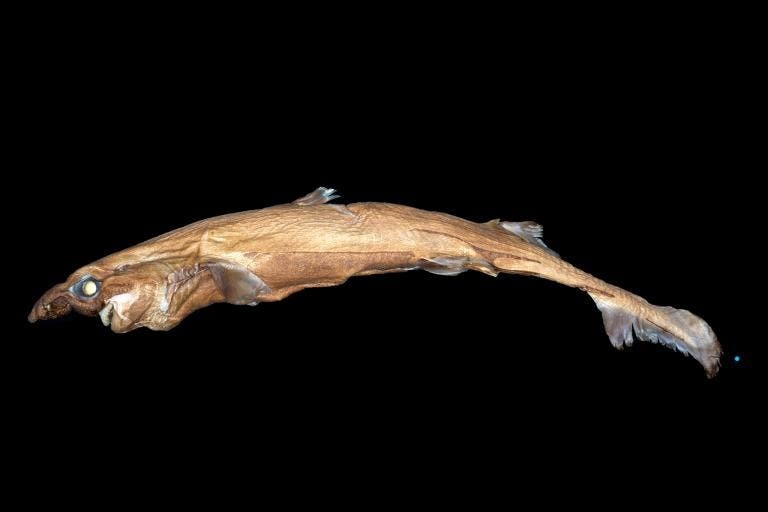 A large part of biodiversity is still unknown, so for us to stumble upon a tiny, new species of shark in a gigantic ocean is really thrilling,” Kajiura said in a university press release. Working with David A. Ebert, the program director of the Pacific Shark Research Center at Moss Landing Marine Laboratories in California, he was able to identify the shark after all these years. Etmopterus lailae is a member of the Lanternshark family, but it has some striking distinctive features. Analyzing and characterizing the shark required diligent categorization and thorough comparisons with other museum specimens. The species also features unusual flank markings that go forward and backward on their bellies, as well as fewer teeth than other sharks. It’s not clear why this shark is bioluminescent, though the team has some ideas. Most likely, this is how the shark lures in shrimp or other prey and recognizes its mates — as in, to be sure it’s mating with the right species. This is just the tip of the iceberg, and there’s certainly much more to discover about this species and others like it, but that’s hard to do for obvious reasons. Since 60% of the planet is covered by water more than a mile deep, that makes the deep sea the largest habitat on Earth. It’s also the most unexplored. No doubt, many surprises still await to be discovered. This particular shark, unfortunately for him, is now hosted at the Bernice P. Bishop Museum in Hawaii.